The Drossmouth Repertory Theatre Company are rehearsing for their performance of a new play, The Morals of Melisande, which is due to open on Monday next. We eavesdrop on the play in rehearsal. Unfortunately the play’s author turns up to help with the production, help which is not entirely appreciated by the Producer, Harry Blacker, or the rest of the cast. Pity the poor Drossmouth Theatre Company. It is Tuesday, the morning of the first rehearsal, and none of the actors know their lines for the first act. The producer is an egotistical moster, the director harbours deep but unspoken resentments and the play, The Morals of Melisande, is as dreadful as its name suggests. Worse, its writer, the niece of one of the board of directors, has come to offer advice. 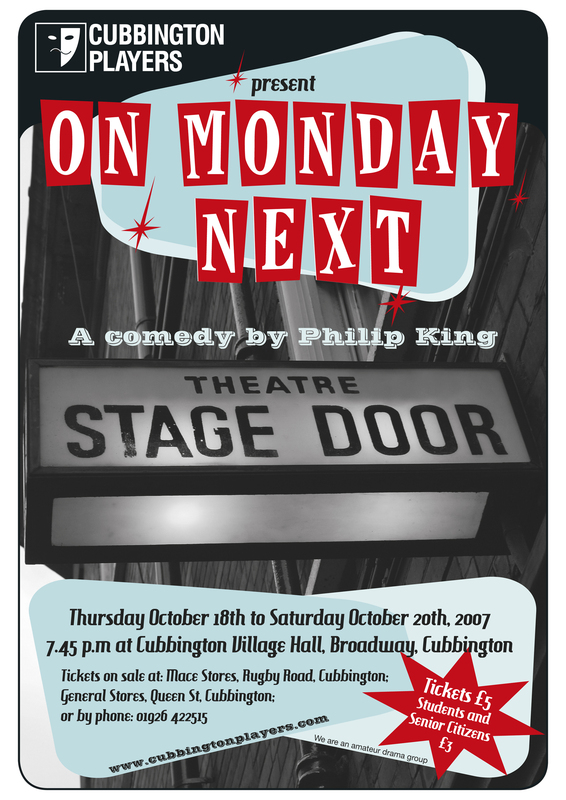 On Monday Next is one of those comedies about actors putting on a play. The worst danger for any company putting these on is that they may end up looking like the disaster onstage, so the Cubbington Players had their work cut out. Barry West launched himself into the role of megalomaniac producer Harry Blacker, and his performance deserved a bigger stage than Cubbington village hall has room for. He made the character likeable enough to win respect from the actors, but the silent tension with director Jackson (Joseph Hughes) also worked well. Two subtle performances from Paul West and Ruth Bishop made the bickering marriage of the “big fish in a small pond” and his more talented wife entirely believable. Brenda West also added depth to the drama as veteran character Maud. But this production worked best when it stuck to the comedy. A sub plot in which young actress Sandra (Ruth Bishop) has to wrestle with the prospect of giving up acting does not really really work and it is not clear if carpenter George really does want to kill the producer. There were occasional stumbles over lines and the final scene (a very tacked-on ending) is awkward, but the only major problem was down to the venue. With up to seven people on stage, some characters can’t find room to be in the right place to deliver their lines. Overall, Cubbington Players emerge from the play-about-a-play ordeal with comparisons safely skirted and credit for an entertaining evening. Maybe a tour of some larger venues might be in order.